A Preliminary Design Review. The objective is to evaluate the project’s readiness to proceed with implementation, that is, build and launch. A review panel evaluates the completeness and consistency of the planning, technical, and cost baselines developed during formulation, and they assess the compliance of the design with requirements. We’ve been planning for almost eight years, and we were selected by NASA about 18 months ago, and in six months, we’ll have our project PDR. The Project PDR, assessing all this at the highest level, is a “Type 0” Independent Lifecycle Review, convened by Thomas Zurbuchen, NASA Science Mission Directorate Associate Administrator and Michael Watkins, the JPL Director. The Psyche team gives presentations of prepared material, according to a pre-defined agenda, to our carefully selected and independently confirmed external Standing Review Board (described further below). 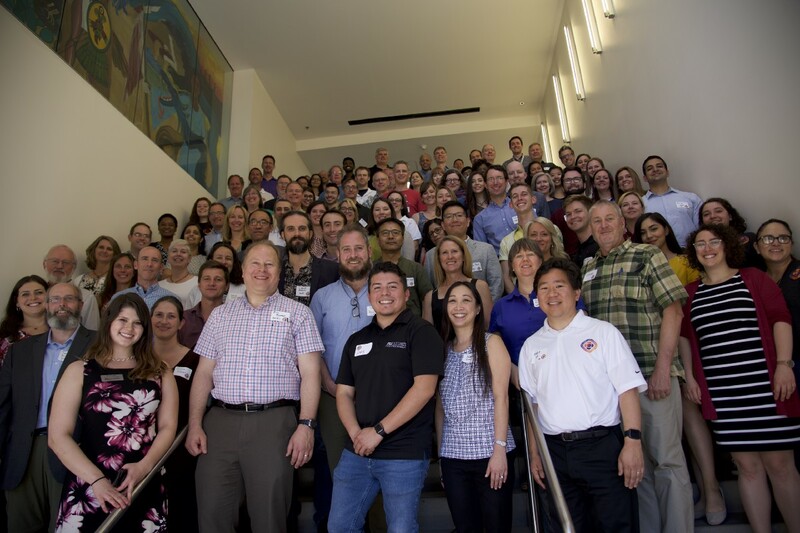 The Project PDR for Psyche mission will be March 11–15, 2019. This is not the kind of thing you can study for the night before. This is the culmination of all the planning and design work we will have done over the previous two years, and indeed, the six years before that. But it’s not just one event! It really is a season — I love the phrase “PDR Season” and it’s made me laugh since I first heard it, though as we move through the next six months I may be less amused. Though I hope not. Each one of these PDRs is a day and a half or two days of presentations to a review board, followed by requests for action (RFAs) from the board and a board report and conclusion about our readiness. How many PDRs are there in PDR season? Great question. I’m constantly recounting and checking new calendar dates against my travel schedule. 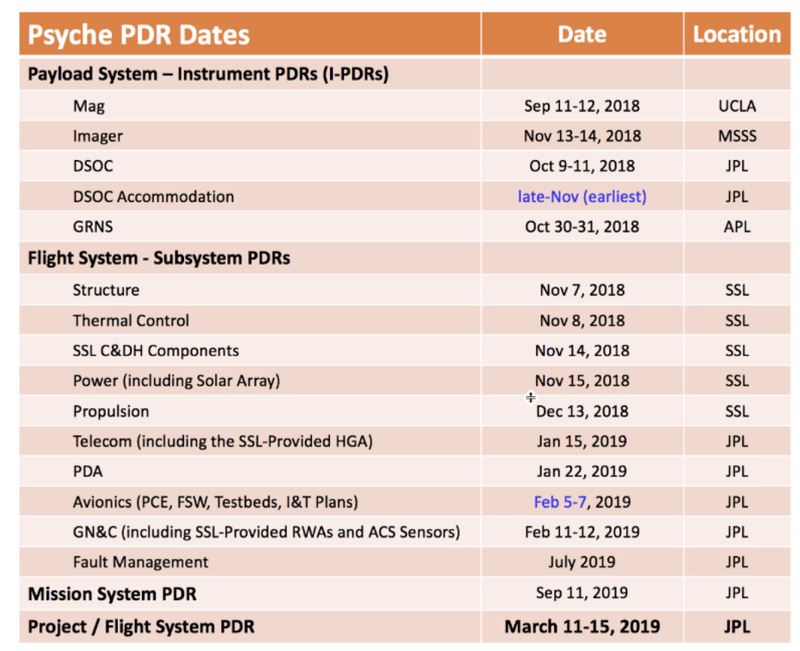 There are PDRs for each instrument and each subsystem, and for the mission system, and for the project as a whole (see table below for the calendar). At the time of writing we have completed two, the magnetometer, and deep space optical communications (the latter not technically a Psyche review, but close to our hearts). We have fifteen to go. Fifteen. Shown in the table below. In addition we also have a series of less formal table-top and peer-review sessions, including those for fault management, assembly, test, and launch operations (ATLO), cold gas, testbed architecture, power/data interfaces, power conditioning units (PCU), and power processing units (PPU). Is it really worth the immense preparation time? I get asked that by people not associated with NASA missions. So far, I think the answer is absolutely. It’s similar to preparing for a major exam: we need to know exactly what we have achieved, and what we are finding to be challenging, and how far we have to go. But unlike an exam, we don’t lose (forget, dismiss, never use again) the information we prepare. It’s there forever, putting a stake in the ground for our progress to launch. All the reviews in the main table have review panels that include specialists from JPL and beyond, and in some cases one or more members of our official standing review board (SRB). This SRB consists of world-class experts spanning the breadth of expertise needed to run a mission. A large number of candidates are proposed by the project (us), and then vetted and commented upon and replaced or approved by Marshall Space Flight Center personnel and by NASA Headquarters personnel. Each person is invited, and approved, by NASA HQ. That’s the group that will help Psyche mission all the way through launch. These experts are at arm’s length, meaning they are ideally able to notice and comment on issues that we may be too close to to notice. We endeavor to form a responsible, professional partnership where they review and guide, and we present and respond. 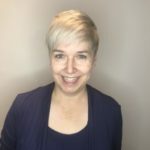 On Psyche team we have a policy of presenting in the clearest way possible exactly where we are, and pointing out the areas where we think we need the most advice. I am opposed to marketing and spin with these high stakes. We started out with the SRB visiting ASU for a lovely dinner and days’ orientation to the mission, and we are starting out on a very good foot. Next up: the gamma ray and neutron spectrometer PDR, at the Applied Physics Lab in Maryland. Much of the team leadership, myself included, will be in reviews or preparation for many of the weeks in the next six months. For me, that means near-weekly travel. After Project PDR, NASA HQ decides whether we are ready to proceed to Phase C, and final design, and build. Cross your fingers — we think we’re ready — we hope NASA thinks so, too. Psyche, here we come!